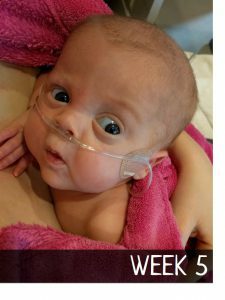 Wow, we have been home a whole eight weeks and I don’t know where the time has gone, it’s flown by! 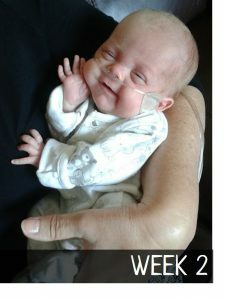 Henry is now 24 weeks old with a corrected age of seven weeks. So what do we have to report? Well, firstly Henry has grown. LOTS. To us he is huge having gained over 3lb since he’s been home, he now weighs a whopping 7lb 6oz! He demands feeding frequently with his norm being three hourly, but he has frequent growth spurts where he ends up on two hourly feeds (and sometimes less), I think he would be feeding non-stop if he had his way! 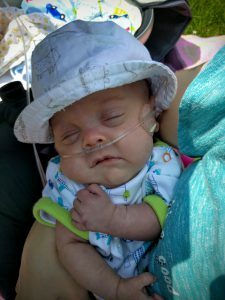 He is still solely breast-fed, which I am very proud of, especially as I have since learned that this is quite uncommon with premature babies. 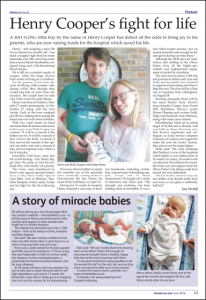 While we’re on that topic I’ve slowly been adjusting to breast-feeding in public too, I was quite nervous about this originally as I’d heard some horror stories of mums getting abuse from members of the public but so far I’ve not had any problems. Hopefully these were just hyped up by the media! 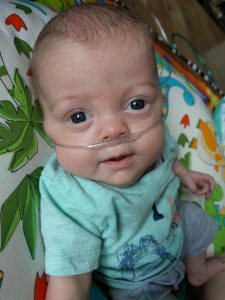 Since coming home we have also been slowly weaning Henry’s oxygen requirements. 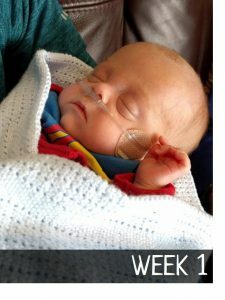 He came home on 0.2 litres but was weaned to 0.1 after just a few weeks and is currently on 0.08, but hopefully will be dropping to 0.06 soon. 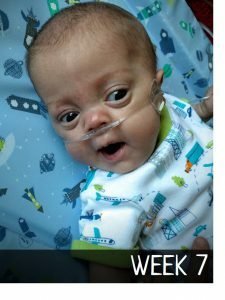 He has regular saturation studies throughout this process to ensure the oxygen he is receiving is right for him. 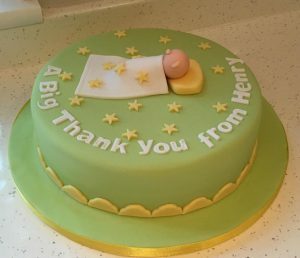 We have taken it very slowly when it came to introducing Henry to new people as we have to be very careful with bugs as even a common cold could put him back in hospital. All our visitors have therefore had to have a clean bill of health and ensure they observe good hand hygiene when touching Henry. Two days ago he had his first visit to somebody else’s house where he met his three cousins for the first time, as they are all school-aged children we had to wait a while until they were all clear of any bugs, they really enjoyed meeting him and holding his hand. He has met a few of his great aunties and uncles and some of his parents’ friends and we are slowly introducing him to new people each week. 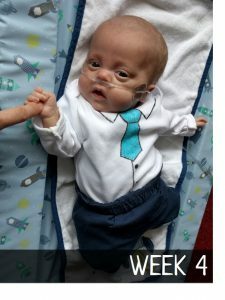 We also enjoyed meeting up with lots of the other babies who were in the unit at the same time as Henry and he had his first “date” with his NICU girlfriend yesterday which was lovely, he was a real smooth mover, casually stretching out his arm around her too! Luckily, we have had some nice weather recently so have enjoyed going for lots of nice walks and had a couple of picnics in the park, the fresh air is really good for his lungs so we try to take him out as often as possible although this week appears to be typically “British” with constant rain! A few weeks ago the hospital held a memorial service at the local church for parents who had lost a child, we attended with Henry in memory of Archie where they read out a message we had written and we were each invited to the front to light a candle, it was a beautiful service and really gave us some much needed time to reflect and think of Archie. We are hoping to scatter Archie’s ashes soon in Mote Park, an area we go to a lot for picnics and somewhere we will spend a lot of time with Henry as he grows up. We have returned to the hospital twice for appointments since leaving. On the last visit we had the all clear from the ophthalmologist that Henry’s ROP has completely cleared up. 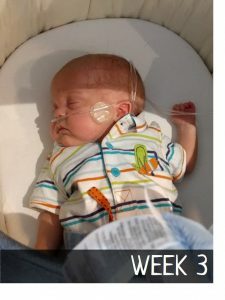 He will have a follow-up appointment in six months just for monitoring, as I’m short-sighted he may inherit this and it could come out a bit early due to his prematurity. We also met up with his consultant recently and she is really pleased with his progress so we are very happy. I think the staff at the unit were quite happy too as we brought cake for everyone courtesy of The Cake Fairy! 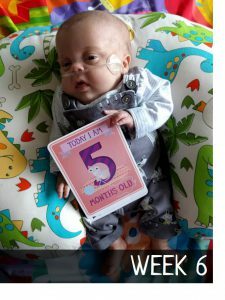 Developmentally, Henry is enjoying lots of tummy-time, he is slowly gaining more control over his head and neck and has been interacting with his toys a lot more over the last few weeks which is nice to see. He also likes doing Baby Yoga (most of the time) which is really beneficial as it helps stretch out his muscles and encourage movement. I found a great YouTube video here that we have been using. We occasionally do baby massage too but he has to be in the right mood for that and isn’t always very tolerant! 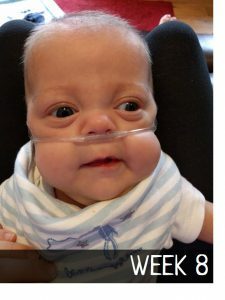 We’re very excited that our next step with Henry is to try him on solid foods. We are going to start him off with some yummy puréed vegetables this weekend. I think he will love it as he seems to get really hungry in the evenings just as we sit down for dinner!